Special ‘Up Island’ workshop offering! CALLING ALL PLANT NERDS, ENTHUSIASTS, NEW AND EXPERIENCED! Join us AGAIN for another YYJ Plant Swap! To gather together as a community and share plant knowledge, interesting/rare/exotic species, and laughs! Everyone is welcome! Your ticket will give you access to the Plant Panel - A Live Streamed Converstaion and Q&A beginning at 7 pm. A goodie bag full of gifts from local restaurants and makers! And of course, the swapping event! All proceeds will be donated to help support local community gardens! Bring at least one HEALTHY cutting, rooted or potted plant to swap (yes, you can bring more than one). You must be ready and willing to part with this plant. TIP: The more interesting/ exoitic the variety, the better chance of scoring something cool yourself! TICKETS // A $5 donation at the door will give you access to the evening! Proceeds will towards supporting local community gardens! A special thank you to Club Kwench, Cultured Kombucha, Shoshana Schwebel for the beautiful hero image, Nourish Kitchen, The Good Planet, Miiko Skin Co, Julia Marie Photography...more to come! 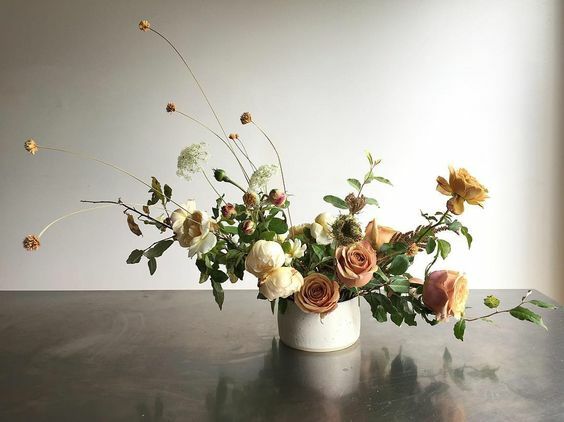 Enjoy a morning in Nourish's Botanical Room with Sarah as she leads you through creating a beautiful fall foraged centerpiece using a combination of dried and fresh stems sources from local flower farms. Sip on bone broth and enjoy a delicious family style brunch afterwards where you can admire your creation and eat with the people you love! beautiful brunch prepared in one of the best brunch destinations in Victoria, Nourish Kitchen & Cafe. Brunch will be after the workshop and will be served family style on a long table so you can socialize with your loved ones or meet someone new! Learn how to make a hanging herb garden! Sarah will guide you through the process of Kokedama and teach you how to care for herbs, inside the home and out! Special guest, Avery Herbert is a Medical Herbalist with a wealth of knowledge! She will share with you valuable information about medicinal herbs and how to incorporate them into your lives! Enjoy botanical beverages and snacks while you peruse Miiko Skin Co's natural plant-based skin care products. Go home with three new herbs to use and enjoy in your kitchen! Explore the principals of kokedama and learn traditional bonsai techniques! Learn all about herbs and how to grow them indoors and out! Learn from a herb guru the medicinal properties of your herbs and how to incorporate them into your holistic healthcare! Choose three organic herbs and make three of your own Kokedama balls! Share bevvies and snacks with other awesome people! Explore Miiko Skin Co's headquarters, sample products and shop! Receive a Kokedama Care Guide to help yours thrive! Please try to park in visitor parking or across the street at the Wholesale Club, around the perimeter of the parking lot. This immersive one-hour workshop will be held at Victoria's Annual Seedy Saturday! Sarah from BOTANIC Creative will share with you everything there is to know about growing, propagating and playing with succulents! Foolproof tricks so you will never kill a succulent again! Sarah will also demonstrate how to create your own succulent terrarium, after which there will be a chance to win the finished piece! There will be plenty of time for Q&A, so bring your notepad, questions, and get prepare for answers! This workshop is FREE with the admission ($7) to Seedy Saturday, which will give you full access to all of the workshops, seminars, vendors and events happening all day long! Plant Care 101 - Love Appreciation Special! Whether you are celebrating Valentine's Day, Galentine's Day or just wanting an excuse to celebrate the love you have for a friend, family member, partner, partners, gym buddy, co-worker...boss... Plant Care 101 is back by popular demand! Join Sarah and Kayla as they give a crash course in plant care! Learn everything there is to know about caring for your tropicals, succulents and air plants. No celebration is complete without BUBS and CHOCOLATE, so in addition to the traditional 101 goodies we will also have a toast to the ones we love (yes, you can toast to your plants). SO we encourage you to bring someone along, your notepads and questions and CELEBRATE LOVE! There will be plenty of time to ask questions and opportunites for 1-1 discussions. You will get to choose a cute little succulent, practice your potting skills and take it home, along with a Plant Care Guide complete with all of the information shared during the evening! Obscure unknown plants, clippings, and containers you are hoping to fill are highly encouraged. If you are bringing in a sickly specimen for diagnosis, please ensure it is in a fully sealed bag. Myself & my coworkers @biophiliadesignare hosting a giveaway! Receive a lush giant baby tear plant from my collection, a handmade macrame planter and a box of botanical potions! 3. tag 2 friends you think would also be interested! Best of luck! *SMALL PRINT* Winner will be chosen at random a week today (Feb. 1st). Winner must be able to pick up from Biophilia, 813 Fort St. Victoria. Giveaway not affiliated with Instagram.